On 15th December 1851, on the Forest Creek gold diggings (now Chewton, Castlemaine), an estimated 15,000 angry diggers attended a meeting to protest the Victorian Government’s doubling of the licence fee – a fee imposed to dig for gold, whether you found any or not. The gathering was called the “Monster Meeting”, after a British tradition of protesters gathering to “monster” the authorities. As a result of the Chewton Monster Meeting, the government backed down. The licence fee stayed at 30 shillings per month. In Australia today it’s worth noting that multi-national mining companies are fighting the government to retain mega-profits. 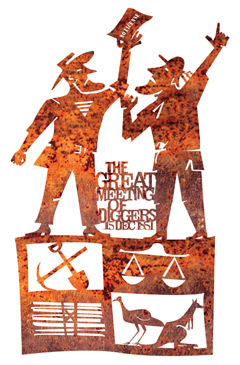 The diggers of 1851 were protesting a tax that was imposed before they earned any money – or not. 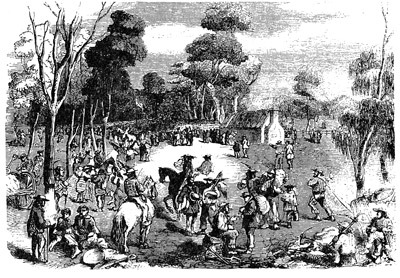 The Monster Meeting was also one of the first signs of the stirrings of democracy; the unity and resistance at Chewton in 1851 predated the more celebrated uprisings in Bendigo (Red Ribbon Rebellion, August 1853) and Ballarat (Eureka Stockade, December 1854). The Monster Meeting was held at the Shepherd’s Hut, just east of the junction of Forest and Wattle Creeks at 4pm. on the 15th of December, 1851. The diggers flew a flag to symbolise their cause, and a David Tulloch drawing of 1851 captured the scene. The accompanying illustration of the flag is courtesy of Geoff Hocking who commissioned its painting by Rhyll Plant and reproduced it in his book “The Red Ribbon Rebellion”. A plaque was unveiled by Mt Alexander Shire to celebrate the 150th Anniversary of the Monster Meeting. This plaque is on the Pyrenees Highway at the Tourist Information Board, and is very close to the site of the original Shepherd’s Hut and the meeting itself. The plaque quotes where, driven by enthusiasm that … “though a single twig may be bent or broken, a bundle of them tied together yields not nor breaks”, the miners resolved “to unite for strength” and “to act and not to talk”. The dispute over Miners’ “rights” became people’s rights and led to achievements of the Monster Meeting being recognised as a key step toward the birth of democracy in the State of Victoria.